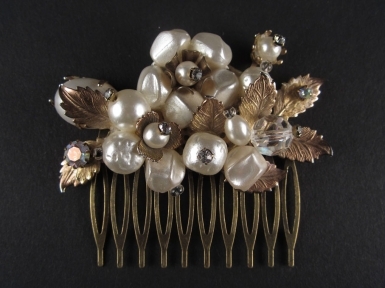 An absolutely stunning vintage ornament comprising vintage faux pearls beset with tiny sparkly rhinestones and surrounded silvertonecomb itself is 65mm wide. (this is a mock up at the moment, and you can see another listing "Tatiana" showing the same ornament with an antique lace background ) - It comes beautifully presented in a black and gold embossed fur-lined (faux of course!)box. FREE POSTAGE ON THIS ITEM.